Update! Numbers have been corrected. By 2030 China plans 110 nuclear plants in operation which is another 60 reactors in addition to the 50 currently in operation or under construction. (I had earlier assumed that the plan was for 110 new reactors). As a contribution to the global use (or non-use) of nuclear power, the European reluctance to use nuclear power is entirely meaningless. For the objectives of killing the European nuclear industry and raising costs for electrical power in Europe, the anti-nuclear lobby has been entirely successful. China currently has 23 nuclear plants in operation and 27 under construction which will be in operation by 2020. By 2020 the Chinese nuclear generating capacity will have almost tripled from the 21GW, 2014 level to be about 58GW in 2020. They have just announced their next five-year plan and some long-term strategies. Another $78 billion has been earmarked to reach 110 nuclear plants in operation by 2030. These plants will be built using indigenous Chinese technology. This technology is now available for export. It is being actively considered for projects in Pakistan and Argentina and now China is even a possible investor in the UK. 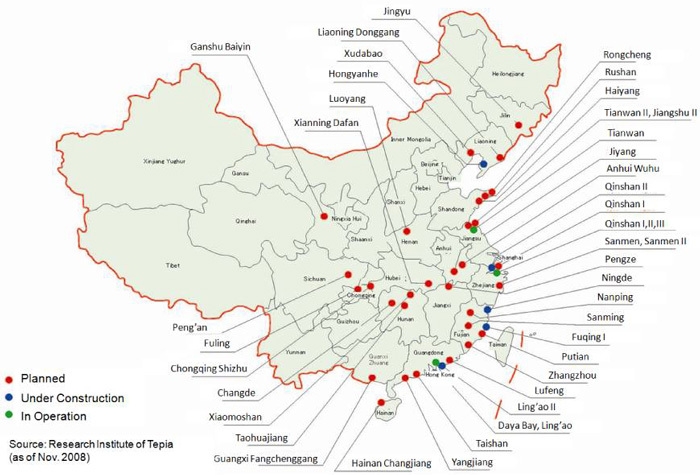 Each Chinese nuclear plant has a capacity of about 1.1GW (1,100MW). At $78 billion for a further 60 plants, the investment cost planned is about $1200/kW. This is incredibly low, not just for nuclear plant, but for any type of power generating plant. Even assuming a volume effect, it can be expected that Chinese nuclear power plants could be exported at about $1,200-1500/kW. China plans to build 110 nuclear power plants by 2030 with an investment of over $78 billion overtaking the U.S. which has 100 such plants amid criticism that Beijing is yet to implement enough measures to develop safety controls in existing projects. China will build six to eight nuclear power plants annually for the next five years and operate 110 plants by 2030 to meet the urgent need for clean energy, Beijing-based China Times quoted plan analysts as saying. China will invest 500 billion yuan ($78.8 billion) on domestically developed nuclear power plants, the report said. According to the China Times, the country plans to increase its electricity generation capacity to 58 gigawatts by 2020, three times the 2014 level. China currently has 23 nuclear power generating units in operation and 27 under construction, about one-third of the world’s unfinished nuclear units. The construction resumed after the Chinese government which put the brakes on nuclear power plant approvals after the Fukushima nuclear accident in Japan in 2011 permitted their construction after a safety review. In Europe the Olkiluoto #3 nuclear plant of 1,600MW in Finland, was first expected to cost about $2,000/kW, but with all the delays and cost overruns it is going to end up costing about $5,300/kW. Even if the unnecessary approvals and cost overruns incurred just to satisfy the environmental lobbies were not there, the investment cost for new nuclear capacity in Europe would still be about $2,600-3000/kW (compare that with about $1,100/kW for gas fired plant, about $2,500/kW for a coal or onshore wind plant and about $6,800/kW for offshore wind power). As a comparison, India currently has 21 nuclear rectors in operation with a capacity just under 6GW. A further 6 reactors giving another 4 GW are under construction. The Indian plan is to reach about 63GW of nuclear capacity by 2032 which, of course, will not happen. My experience of Indian power planning is that about 60% of the plan will be implemented (though the track record is improving). So it is quite probable that India will construct around another 40 nuclear reactors (@800MW/reactor on average) by 2032. (In that period Indian coal consumption would also have trebled). At the Chinese cost of exporting nuclear plant for around $1,200-1,500/kW, it is only to be expected that the electrification of Africa and nuclear expansion in S. Asia will be satisfied to a large extent by nuclear power. A big chunk of that would be with Chinese technology. I have no doubt that European nuclear plants operate to much higher safety standards than the current Chinese reactors, but the European nuclear industry is now dead and it is Chinese nuclear technology which will be affordable and will prevail. it has increased the cost of electric power in Europe. It is worth remembering that while the Great 2011 Earthquake and Tsunami killed some 18,000 people in Japan, the Fukushima accident it caused has killed no-one directly due to radiation. Now, less than 30 years after the major disaster at Chernobyl, the area is very far from being some nuclear waste-land, and plant and wild-life are thriving as never before in the region. 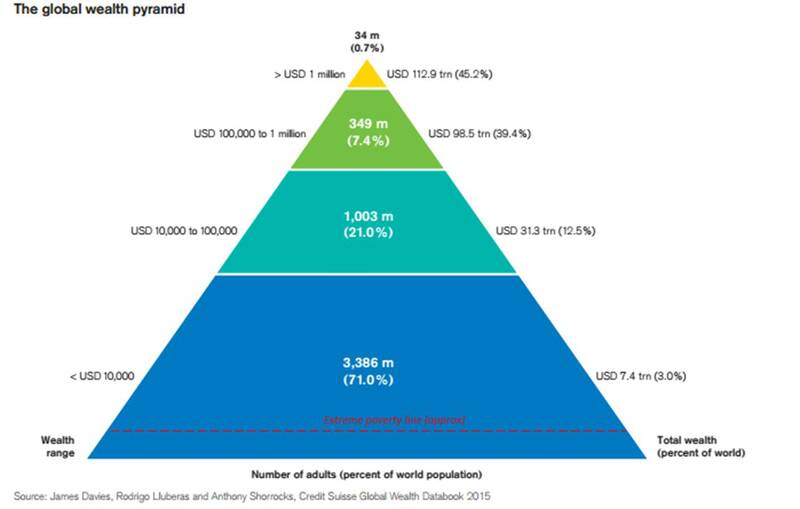 Credit Suisse has published its Global Wealth report and its accompanying Databook. The data are based on the world’s adult population of about 4.8 billion. What is immediately obvious is that the wealth is very badly skewed with 71% of the world’s adults having a net worth of less than $10,000, 21% have net worth between $10,000 and 100,000 while just 8% have wealth of over $100,000. (I have also added the line of those in extreme poverty). However my take is that the pyramid is actually a reflection of wealth creating ability. The challenge is to make wealth creation opportunity less sensitive to the having of wealth. That suggests to me that it is not just a redistribution from rich to poor that is required in the first instance, but the provision of wealth creation opportunity for those having lower net worth. If extreme poverty can be eliminated, and wealth creation opportunity be made less dependant upon having wealth, then we will have a resultant wealth distribution that automatically matches the wealth creation ability of individuals. It has a large base of low wealth holders and upper levels occupied by progressively fewer adults. We estimate that 3.4 billion individuals – 71% of all adults in the world – have wealth below USD 10,000 in 2015. A further billion adults (21% of the global population) fall in the USD 10,000–100,000 range. 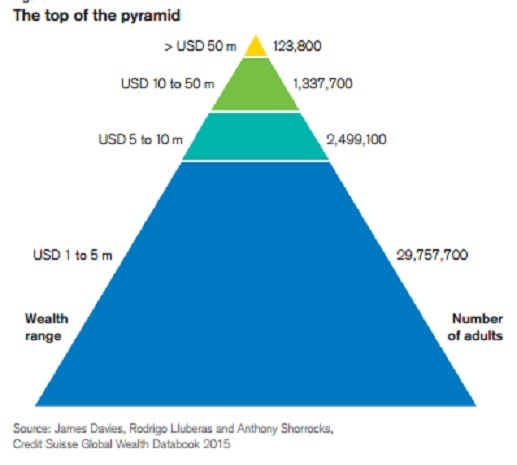 While average wealth is modest in the base and middle tiers of the pyramid, total wealth here amounts to USD 39 trillion, underlining the economic importance of this often neglected segment. Each of the remaining 383 million adults (8% of the world) has net worth above USD 100,000. This group includes 34 million US dollar millionaires, who comprise less than 1% of the world’s adult population, yet own 45% of all household wealth. We estimate that 123,800 individuals within this group are worth more than USD 50 million, and 44,900 have over USD 100 million. The take-away from this depends somewhat on from which side of the political spectrum the data are viewed. Looking from the left it is a strident call to arms to “take from the rich and give to the poor”. But this, I think, is just a little too simplistic. How net worth is distributed generally reflects not only wealth concentration but also wealth creation. Merely redistributing existing wealth will actually reduce the total amount of wealth that is created. The bulk of wealth creation thus lies at the initiative of those having the most wealth. It is this coupling between having wealth and wealth creation opportunities which needs to be addressed. It is wealth creation opportunities for those at the lower reaches of the pyramid which is the real need. It is the cliche – but true – of giving a man a fish (wealth) or teaching him how to fish (or create wealth). Just redistribution will not increase the world’s wealth creation and it is more likely that it will reduce most for those having the lowest net worth. And that would be entirely counterproductive. However there is little denying that at the top of the pyramid, the concentration of net worth can be almost obscene. Just 123,800 individuals are each worth over $50 million and 44,900 of them are each worth over $100 million. Prior to about 1995, I held all telephone numbers important to me in my head. Now, I can remember my own mobile number but not my wife’s. In fact there are very few mobile numbers I bother to keep in my memory at all. I rely entirely on my phone. But it must be that I have taken a decision in my subconscious not to clutter my memory with these numbers – since they are so easy to access on my device. A new study suggests that we are damaging our long term memories by our dependence upon our digital devices. I am not convinced. I suspect they asked the wrong questions. They have not, I think, considered or sought the type of new long-term memories that are built up instead. The study is by Kaspersky Lab and therefore needs to be taken with a very large bushel of salt. It is I think rather narrow and a little trivial. Connected devices enrich our lives but they have also given rise to the potentially risky phenomenon of Digital Amnesia. Many people underestimate just how exposed their externally-stored memories can be, rarely thinking about the need to protect them with IT security, such as anti-virus software. Kaspersky Lab is committed to helping people understand the risks their data could be exposed to, and empowering them to tackle those risks. I cannot see that the volume of long term memories is affected. The content of the long term memories we unconsciously choose to hold changes. An over-reliance on using computers and search engines is weakening people’s memories, according to a study.It showed many people use computers instead of memorising information. Many adults who could still recall their phone numbers from childhood could not remember their current work number or numbers of family members. Maria Wimber from the University of Birmingham said the trend of looking up information “prevents the build-up of long-term memories”. The study, examining the memory habits of 6,000 adults in the UK, France, Germany, Italy, Spain, Belgium, the Netherlands and Luxembourg, found more than a third would turn first to computers to recall information. The UK had the highest level, with more than half “searching online for the answer first”. But the survey suggests relying on a computer in this way has a long-term impact on the development of memories, because such push-button information can often be immediately forgotten. 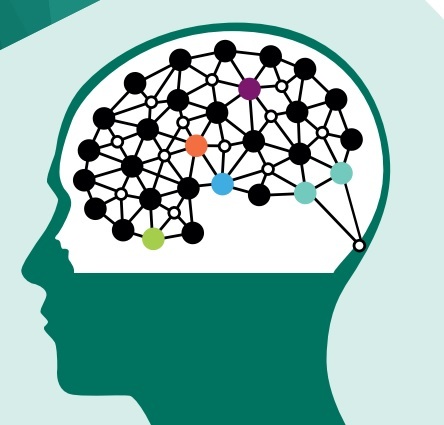 “Our brain appears to strengthen a memory each time we recall it, and at the same time forget irrelevant memories that are distracting us,” said Dr Wimber. ……. ….. Among adults surveyed in the UK, 45% could recall their home phone number from the age of 10, while 29% could remember their own children’s phone numbers and 43% could remember their work number. The ability to remember a partner’s number was lower in the UK than anywhere else in the European survey. There were 51% in the UK who knew their partner’s phone number, compared with almost 80% in Italy. The study from Kaspersky Lab, a cybersecurity firm, says that people have become accustomed to using computer devices as an “extension” of their own brain. It describes the rise of what it calls “digital amnesia”, in which people are ready to forget important information in the belief that it can be immediately retrieved from a digital device. The study highlights how, as well as storing factual information, there is a trend to keep personal memories in digital form. Photographs of important moments might only exist on a smartphone, with the risk of their loss if the device is lost or stolen. My own observations about myself are that I no longer bother memorising digital information which is easily accessed on devices, but I find (or I think I find) I can remember qualitative information (colours, pictures, past conversations, smells, ideas) in much greater detail than I used to. When the population implosion threatens …..
By 2050, virtually all parts of the world, except some parts of Africa, will be witnessing a decline in population. Until then, migrations of peoples will serve to maintain the ratio of productive to “non-productive” people. (By then, the non-productive will probably be defined as those under 20 and those over about 70). But going forward, migration from declining source populations will no longer be able to provide even a temporary solution. The fundamental decline in fertility rates will be a consequence of the widespread acceptance of women’s rights, the increasing liberation of women in Asia and Africa, and the ready availability of contraception and abortion. Increasing longevity will mitigate population decline to some extent but will exacerbate the declining ratio of productive/unproductive population. The threat will be of an accelerating decline. Alarmism will no longer be about “population explosions” but about the coming “population implosion”. The decline of rural populations will threaten food supplies, though mitigated by increasing automations and genetically modified crops. Growth will be limited, not so much by capital or raw materials, but by the availability of personnel. In developed countries, tax revenues will stagnate or begin to decline. Sustainable communities, somewhat smaller than the current nation states, will start husbanding their people resources and their (local) tax revenues. “National” programs – health, education and even infrastructure – will increasingly shift to be “local”. The immigration issue of the day will be about preventing any influx of non-productive peoples. Incentives will be offered to attract productive businesses and people. Some isolated areas already below critical populations or population-mixes, which survive only on subsidies, will be “abandoned” financially. That will, in turn, shift people to areas which exceed the critical mass for the provision of welfare and other services. Successful communities will be those which attract productive people and provision of local jobs, education and health services will be the competitive factors. Education services provided will be linked to performance. Health services to be provided for any individual will be judged by the cost of the service against the benefit of the individual’s remaining productive life. Health services for the elderly will gradually be removed from welfare services and will all have to be purchased. Assisted deaths for the elderly will be as readily available as abortions. The globalisation paradigm which would have been in effect for a century will shift to a new “localisation” meme. As power to raise revenues is devolved increasingly to smaller, sustainable communities, “national” defense budgets will be slashed. Expansionism will no longer make any sense. Conflicts may still occur over resources (water, rare metals, rare earths ….) but will decline as population declines. Virtually every local government will then be engaged in trying to increase fertility rates. Tax breaks and extra payments will be available for every child. “Political correctness” will shift to the having of many children. But all these measures will not have much effect in increasing fertility rates. Surrogacy will pay very well until the artificial womb is developed. That will be the game changer. Then community governments will move to control artificial fertilisation from donor sperm and eggs. The birth of children will move into the “public” sphere. Genetic scanning will be increasingly used prior to allowing a foetus to develop in an artificial womb. Humans will then only be required to supply their sperm or their eggs. They will no longer be required to perform as parents. Mating will no longer be an activity connected to the production of children. The children will be brought up in community creches. The fertility rate will become a completely controllable parameter. Eventually, so will the genetic make up of the children being produced. Some will have their genes tailored to meet some specific community need. Others will be mass-produced when “drones” are required in large numbers. The most powerful committee in any community will then be that which chooses which egg will be fertilised by which sperm. It is population decline which will lead inevitably and remorselessly to the Brave New World. Posted in Alarmism, Demographics, Development | Comments Off on When the population implosion threatens ….. Being poor is a relative term. To be in “extreme poverty” is an absolute measure. To be “poor” does not require being in “poverty”. The “poor” relative to the “rich” will always be with us and are just as necessary as the “rich”. In fact, that distinction between rich and poor is necessary as long as humans are to be considered individuals with aspirations and not just clones. Income inequality is often equated – especially by those with communistic leanings – with poverty, but this is simply wrong. Income inequality may be an indicator of the ratio of “poor” to “rich” but to be “poor” need have nothing to do with being in “poverty”. “Poverty” is not necessary and the goal is to eliminate extreme poverty by 2030. 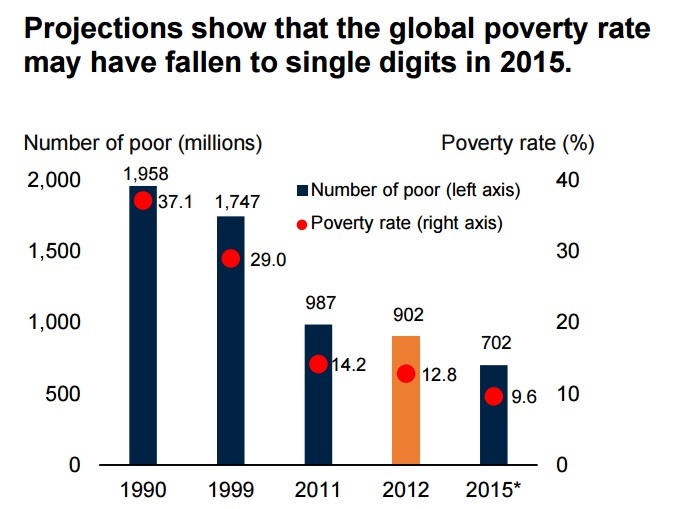 The 2015 World Bank Research Note on Extreme Poverty is now out. In 2015, for the first time ever, and in spite of the global population being at an all time high, the number of people in extreme poverty has reduced to less than 10%. 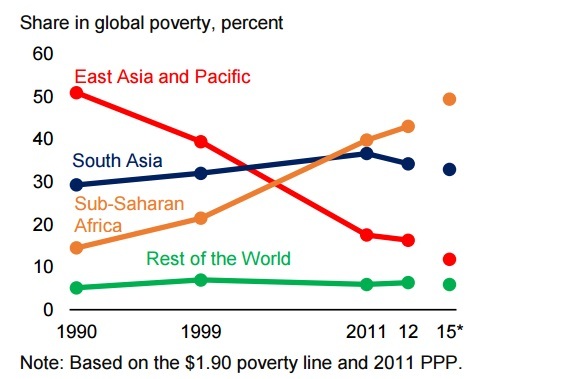 In spite of the population increase, the total number in extreme poverty is at the lowest in 25 years. But that is still 700 million (900 million in 2012) in extreme poverty. Sub-Saharan Africa and S Asia are where the misery is concentrated. The number of people living in extreme poverty around the world is likely to fall to under 10 percent of the global population in 2015, according to World Bank projections released today, giving fresh evidence that a quarter-century-long sustained reduction in poverty is moving the world closer to the historic goal of ending poverty by 2030. The Bank uses an updated international poverty line of US $1.90 a day, which incorporates new information on differences in the cost of living across countries (the PPP exchange rates). The new line preserves the real purchasing power of the previous line (of $1.25 a day in 2005 prices) in the world’s poorest countries. Using this new line (as well as new country-level data on living standards), the World Bank projects that global poverty will have fallen from 902 million people or 12.8 per cent of the global population in 2012 to 702 million people, or 9.6 per cent of the global population, this year. The official 4 month monsoon season (June – September) has ended and the cumulative rainfall falls into the “average” category (from -20% to + 20% of the long-term average), but only just, at -14% for the country as a whole. Rainfall was high in June, quite low in July and August and recovered somewhat in September. Good rainfall continues in October as the monsoon withdraws. Much of this is in deficient regions of Central and South India which will further mitigate the deficiency numbers. Jammu & Kashmir recorded 15% excess rains, while next door, Himachal Pradesh was 23% deficient. West Rajasthan recorded 46% excess, while East Rajasthan ended 10% down. 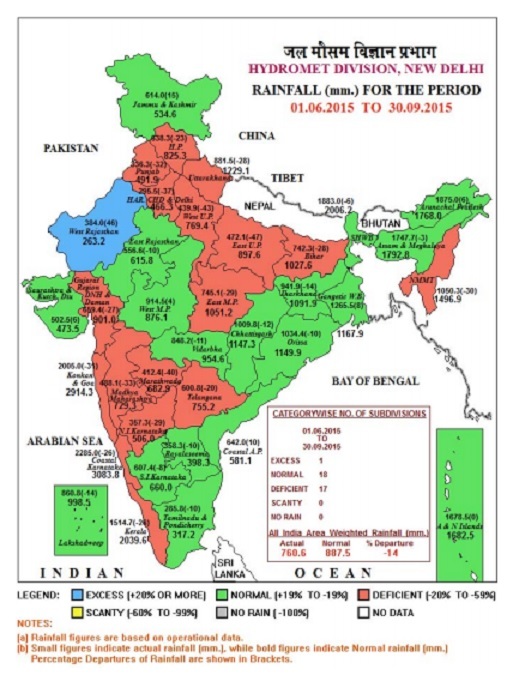 Telangana remained rain deficit to the tune of 20% and Andhra Pradesh recorded 10% excess. West Madhya Pradesh recorded normal rains and was at +4% while East Madhya Pradesh was 29% in deficit. West Bengal recorded 8% excess while adjacent Jharkhand was 14% in deficit. Both Marathwada (-40%) and Vidarbha (-11%) were in rain deficit but the variation was large. From a growth perspective, the 2015 monsoon will be a neutral event (i.e. it will make its “normal” contribution to the economic cycle). The impact will not provide any additional impetus to growth but will not hinder growth either. As the Reserve Bank has now reduced its reference interest rates by 50 basis points and most of the banks now seem to be passing on about 40 basis point reductions to their lending rates, the cost of lending is likely – for this year – to be have a much greater impact on the economy than the effects of the monsoon. But at least the monsoon will now play its “normal” part in feeding the economic cycle. The monsoon deficiency should not contribute too much to inflation in food prices. The immediate impact of a good monsoon is increased employment in rural areas (September – October) followed by increased rural consumption of consumer goods (October – December) and even sales of two-wheelers and tractors (November – March). Pesticide sales increase during the monsoon and again in the following pre-monsoon period. Fertiliser sales pick-up strongly in the pre-monsoon period following a good monsoon. The December – June period following a good monsoon is when rural “investments” are mainly made (machinery, equipment, construction, consumer goods). The indirect effects of agriculture on the services and manufacturing sectors are critical. However, even more important is the effect of a good monsoon on food price stability and general economic sentiment. But I foresee no booms or fireworks in Indian economic activity over the next 6 months. That requires – among other things – the “feel-good” factor that a bumper monsoon brings. Still, 12 months of steady, sustainable growth is probably more valuable than some short-lived volatile balloon of activity. After the China circus, steady rather than spectacular will be a welcome relief. Two reports have just been issued. The first is the World Bank’s assessment of doing business in India where India’s ranking among countries is depressingly low (considering the size of India’s economy). At 142nd of 189 countries India is in the bottom quartile of all countries. The second report assesses the relative success of the various Indian states in implementing business reforms and is issued by the World Bank and the Indian Government. The WB assessment is broken down into 10 main areas and they have ranked 189 countries. In most categories the Indian ranking is embarrassingly low. (Even where the ranking is not too embarrassing, I note that there is a downside. Getting credit is apparently not too difficult but the other side of the coin is that the banks are sitting with a great deal of bad debt. Similarly minority interests are well protected but there are many cases of tyranny by the minority). I show the Indian rankings alongside those for Russia, China, Bangladesh and Mexico for reference. The second report deals with the performance of the different states in implementing reforms. Of course the states ranked high are now crowing over those ranked lower down. The hope of the Indian government is that this league table will enhance competition between states and will add an impetus to development. The ranking of the NCR of Delhi is almost pathetic and lies even behind an Uttar Pradesh (boosted by Noida) and a Haryana (boosted by Gurgaon). 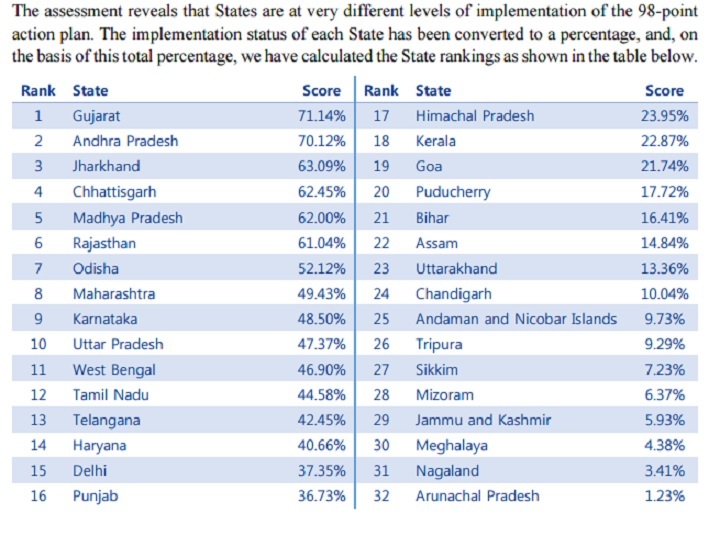 And while Gujarat is crowing over Bihar and Tamil Nadu peevishly questions the data, they all seem to forget that these are just state rankings for a country ranking which is abysmally low. States lying below 50% are at levels comparable to the lowest 10% of the 189 countries that have been ranked. While the use of base 10 and 12 probably came first with the need for counting generally and then for trade purposes (animals, skins, weapons, tools…..), the 12 and the 60 came together to dominate the measuring and reckoning of time. Twelve months to a year with 30 days to a month. Twelve hours to a day or a night and 60 parts to the hour and 60 parts to those minutes. There must have been a connection – in time as well as in the concepts of cycles – between the “invention” of the calendar and the geometrical properties of the circle. The number 12 has great significance in Hinduism, in Judaism, in Christianity and in Islam. The 12 Adityas, the 12 tribes of Israel, the 12 days of Christmas, the 12 Imams are just examples. My theory is that simple sun and moon-based religions gave way to more complex religions only after symbols and writing appeared and gave rise to symbolism. Trying to construct a time-line is just speculation. But one nice thing about speculation is that the constraints of known facts are very loose and permit any story which fits. So I put the advent of numbers and counting at around 50,000 years ago first with base 10 and later with base 12. 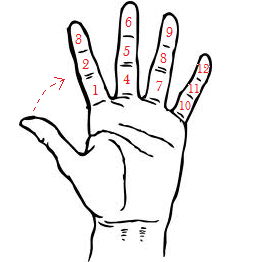 The combination of base 10 with base 12, I put at around 20,000 years ago when agricultural settlements were just beginning. The use of 60 must then coincide with the first structured, astronomical observations after the advent of writing and after the establishment of permanent, settlements. It is permanent settlements. I think, which allowed regular observations of cycles, which allowed specialisations and the development of symbols and religion and the privileged priesthood. That probably puts us at about 8 -10,000 years ago, as agriculture was also taking off, probably somewhere in the fertile crescent. Wikipedia: The Egyptians since 2000 BC subdivided daytime and nighttime into twelve hours each, hence the seasonal variation of the length of their hours. The Hellenistic astronomers Hipparchus (c. 150 BC) and Ptolemy (c. AD 150) subdivided the day into sixty parts (the sexagesimal system). They also used a mean hour(1⁄24 day); simple fractions of an hour (1⁄4, 2⁄3, etc. ); and time-degrees (1⁄360 day, equivalent to four modern minutes). The Babylonians after 300 BC also subdivided the day using the sexagesimal system, and divided each subsequent subdivision by sixty: that is, by 1⁄60, by 1⁄60 of that, by 1⁄60of that, etc., to at least six places after the sexagesimal point – a precision equivalent to better than 2 microseconds. The Babylonians did not use the hour, but did use a double-hour lasting 120 modern minutes, a time-degree lasting four modern minutes, and a barleycorn lasting 31⁄3 modern seconds (the helek of the modern Hebrew calendar), but did not sexagesimally subdivide these smaller units of time. No sexagesimal unit of the day was ever used as an independent unit of time. 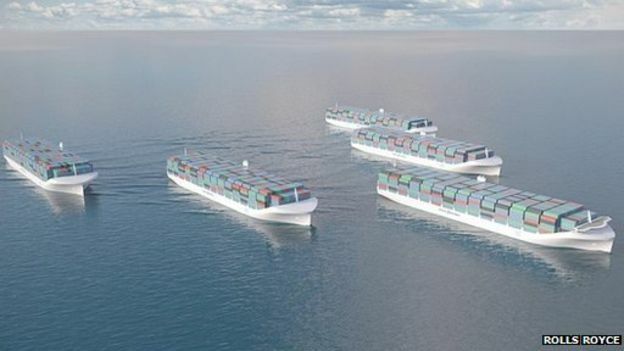 After flying drones and the coming of driverless cars it is the turn of autonomous ships. The Finnish Funding Agency for Technology and Innovation (Tekes) is funding an €6.6 million project called the Advanced Autonomous Waterborne Applications Initiative, which Rolls-Royce has been appointed to lead. 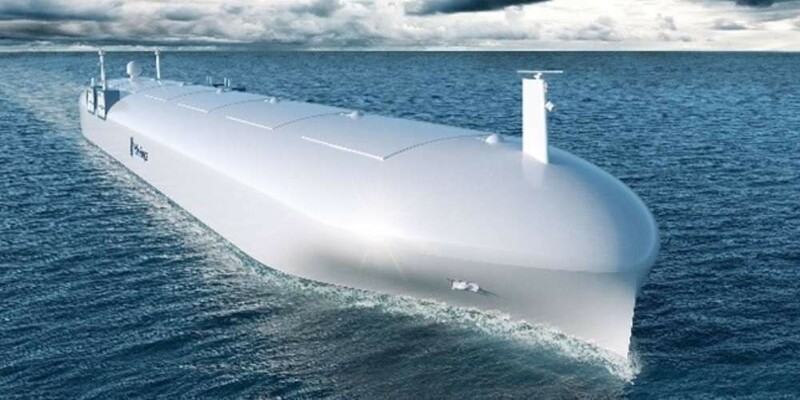 The project aims to produce the specification and preliminary designs for the next generation of advanced ship solutions – the unmanned, “drone” cargo ship. …… The project will run until the end of 2017 and will pave the way for solutions – designed to validate the project’s research. The project will combine the expertise of some of Finland’s top academic researchers from Tampere University of Technology; VTT Technical Research Centre of Finland Ltd; Åbo Akademi University; Aalto University; the University of Turku; and leading members of the maritime cluster including Rolls-Royce, NAPA, Deltamarin, DNV GL and Inmarsat. Rauli Hulkkonen, Tekes, Chief Advisor, said: “This project is a fantastic opportunity to establish the Finnish maritime cluster as the world leader in maritime remote control technology. Esa Jokioinen, Rolls-Royce, Head of Blue Ocean Team, said: “Rolls-Royce has extensive experience of successfully coordinating multi-disciplinary teams developing complex technologies. We bring a world leading range of capabilities in the marine market to the project including vessel design, the integration of complex systems and the supply and support of power and propulsion equipment. We are excited to be taking the first concrete steps towards making remote controlled and autonomous ship applications a reality. The wide ranging project will look at research carried out to date before exploring the business case for autonomous applications, the safety and security implications of designing and operating remotely operated ships, the legal and regulatory implications and the existence and readiness of a supplier network able to deliver commercially applicable products in the short to medium term. 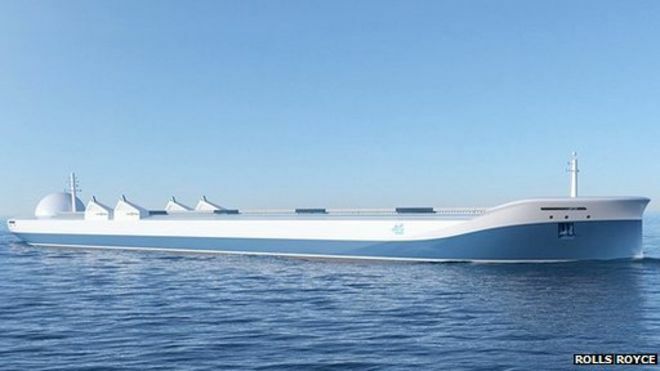 The technological work stream, which will be led by Rolls-Royce, will encompass the implications of remote control and autonomy of ships for propulsion, deck machinery and automation and control, using, where possible, established technology for rapid commercialisation. The Rolls-Royce Blue Ocean team is responsible for research and development of future maritime technologies and focuses on disruptive game-changing innovations. By combining new technologies with new approaches to ship design and system integration, the team aims to reduce operational costs, minimise emissions and enhance the earning capability of vessels. The team has developed a range of autonomous ship concepts as well as innovative designs for various ship types. Robot ships are currently illegal and the whole maritime regulatory environment would need to be changed to suit. If driverless cars become a reality by 2020, then there is no reason why robot fleets of cargo ships could not be in use by 2030. Bureaucracy will probably be a bigger barrier than technology. Is embarrassing Gujarat data holding back the Indian Health and Nutrition Survey? According to the BBC, the massive undertaking that is the Indian Health and Nutrition Survey has been completed, should have been released in October 2014, was last issued in 2007 and even has an encouraging story to tell. But the data on Gujarat is not an edifying tale in comparison to other states. Economic growth in the state has not translated into any major advance compared to other states. In fact the Gujarat performance is worse than most. 42% of all children are stunted and half of all children are malnourished. Is the report too damaging to Modi’s Gujarat story? And is it therefore being held back by Modi’s public relations managers? The official position is that the methodology is being reviewed. But it is more likely being held back to somehow massage the Gujarat figures. It will be difficult because copies of the completed – but not officially released – report are now available widely. Good health data is rare in India. The last time the country published a comprehensive, state-wide survey was back in 2007. So why hasn’t a vast survey of women and children carried out by the Indian government with the UN agency for children, Unicef, been released? India’s so-called Rapid Survey of Children was a huge undertaking. Almost 100,000 children were measured and weighed and more than 200,000 people interviewed across the country’s 29 states. The final report was due for publication in October last year, the BBC understands. Yet, more than half a year later, the important body of data remains secret. Leading development economist Jean Dreze describes the delay in publication as “an absolute scandal”. “All the neighbouring countries including Bangladesh, Nepal, Sri Lanka, Bhutan, Pakistan and even Afghanistan have up to date nutritional surveys,” he says. “It is hard to account for a 10-year gap without attributing some sort of political reluctance.” ….. Looking just at the overall figures, India’s reluctance to publish the survey is rather surprising. It shows the country has an encouraging story to tell. Indicators of malnutrition are still very high, far higher than most African nations, but they are improving. Ten years ago, two-fifths of children under five were underweight, now it is more like a third. However, the survey confirms large and enduring discrepancies between states, including the continuing strikingly poor performance of the Indian prime minister’s home state, Gujarat. As chief minister, Narendra Modi ran the state for more than a decade. His general election campaign was based on the promise that he would do for India what he had done for Gujarat. Posted in Behaviour, Development, India, Politics | Comments Off on Is embarrassing Gujarat data holding back the Indian Health and Nutrition Survey?